Each year, nearly a million seniors and people with disabilities use the services offered by Ontario’s Community Support Service (CSS) providers, like West Toronto Support Services (WTSS) – and that demand is growing. Even if you’ve never heard of these unsung heroes of the health care system, you’ve benefited from their work. 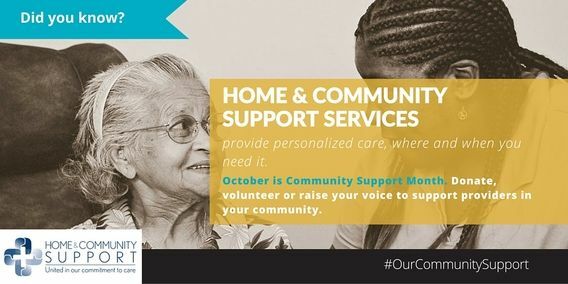 October is Community Support Month, an opportunity for Ontarians to get to know, donate, volunteer and raise their voices in support of the not-for-profit CSS providers in their local areas. They offer a wide variety of services which help people live independently in their own homes for as long as possible. These services include attendant care, adult day programs, Meals on Wheels, respite for family caregivers, personal care and home support, transportation to medical appointments, and supportive housing programs (to name just a few!). Individuals prefer to receive support in the comfort of their own homes and communities, not in hospitals and institutions. By meeting this need, CSS providers like WTSS improve the quality of life of clients and their families – and they also create significant cost-savings to Ontario’s health system, freeing up desperately needed funds and hospital beds. They are a crucial part of building the strong, sustainable health care system we will all need in the future. Join the conversation on social media at #OurCommunitySupport.